A new interview with John Lasseter is up over at Coming Soon. They also have a video chat/interview with John Travolta and Miley Cyrus and Mr. Walton the soon to be famous Rhino. 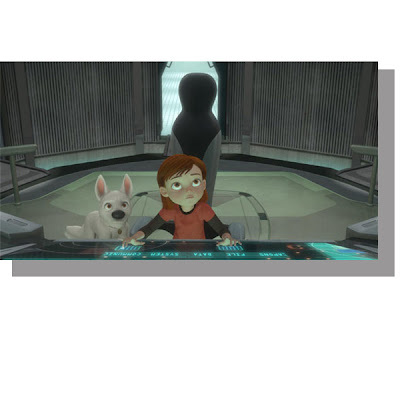 The Los Angeles Times has put its review of Bolt online. The Gray Lady has her thoughts on the film as well. Salon has a review up about Bolt. Cinema Blend has a review of the film as well. Yahoo! Movies has a nice positive one also. This film will be yanked from the theme parks and consumer products faster than you can imagine. By 2009 we'll say "Bolt who?" Just give Wall-E the Oscar now and let the Mouse stop competing with itself. Give this doggie a pooper scooper. So you've seen i I take it? Sigh. I'm glad your powers of prediction are sooo great. Moron. I saw this on the studio lot last week and was highly skeptical of it. Not anymore. It's a wonderful film. I can't wait to take my daughter this weekend. Yeah, a real gem. As I've said before, this movie is "good enough" for kids. Not great. So you think it will beat out Wall-E for an award? Honor, when do we get your review? If you think this movie is "good enough" for kids then you clearly haven't seen it. The movie rises well above a kids movie. It's a very good movie that will engage adults as well as children. Once you've seen you can rag it all you want, but you haven't seen it or you wouldn't have made that statement. Even in all the reviews they've noted how the story appeals to adults as well. But I guess you didn't read those either. Should he spent more time making posts about Dreamworks or Batman. Your shrill rants and insistence of Bolt being a mass appeal movie just didn't catch on. Go be a blind/devoted cheerleader for the company's next project.